The SNMMI-TS Leadership Academy has received the American Association of Medical Society Executives’ (AAMSE) 2017 Profiles of Excellence Award in the Leadership Category. 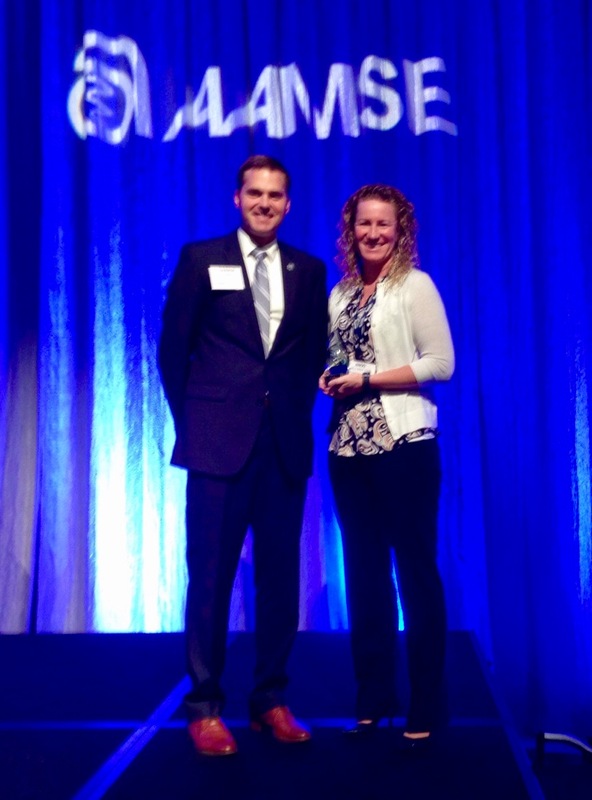 Nikki Wenzel-Lamb, SNMMI director of leadership and SNMMI-TS administrator, attended the awards ceremony and accepted the award on behalf of the Leadership Academy from AAMSE Executive Director Darrin Hubbard, CAE. The SNMMI-TS Leadership Academy, which celebrated its 10th anniversary this year, is a two-day course that hones the leadership and organizational skills of participants, helping them become more engaged and effective leaders at the regional and national levels. To date, the academy has more than 125 graduates, many of whom are now holding leadership positions at their institutions or within SNMMI at the chapter or national level. AAMSE is the professional association of over 1,300 medical society executives and staff specialists. Through its more than 300 member organizations, AAMSE advances the profession of medicine through education, communication of knowledge, leadership development and collaboration. As medical societies make positive impacts every day on their members and in their communities with programs and campaigns that advance the field of organized medicine and improve the lives of physicians and the patients they serve. AAMSE is committed to recognizing these efforts with the Profiles of Excellence Awards. A judging panel consisting of AAMSE members reviews submissions and awards recipients for excellence in five areas of medical society management: advocacy, communications, education, leadership and membership, with separate divisions for societies with budgets over $2 million and budgets under $2 million. One medical society is also honored with the President’s Award for Innovative Physician Engagement Within Organized Medicine.